Shooting in Camera Raw Mode has some distinct advantages over shooting in jpegs. Most cameras now give you the option to shoot in camera raw or jpeg or both. Camera raw files contain raw data and are not processed in-camera like jpegs are. When you shoot in jpeg, the camera will automatically adjust the saturation, contrast and white balance. The camera also compresses the file to a smaller file size and potentially produces some degradation to the file. Every time you open and close a jpeg file in a photo editing program, image quality will suffer. Although raw file sizes are huge for each image(My full-frame Canon produces an image file of approximately 30mb), there is a benefit to the large size. Shooting in raw produces a 16 bit image (post raw conversion) to work with. This means that the file has 65,536 brightness levels to work with as opposed to a jpeg file’s 8 bit space with just 256 brightness levels. With more pixels and data to work with, you can make larger moves in Photoshop without producing pixelation and noise. I’ve really noticed this in Photoshop 6. If you are only taking pictures of your dog Spot, you can get away with shooting in jpeg. Jpeg files are smaller and take up much less memory on your hard drive and memory card. Now, to work with a camera raw file, you need Camera Raw Software. Your camera manufacturer should provide this software on the disc included with your camera purchase. You can also download the camera raw software from the manufacturer’s website. Make sure you download the latest version for your particular camera model. If you have Photoshop, the Camera Raw program is included but you will have to download the latest camera raw support for your camera model. If you look at the top of the screen shot below, you will see the software support is Camera Raw 7.1- Canon EOD 5D III. When I open a raw file in Adobe’s Bridge, the Camera Raw program automatically opens because it is a camera raw file. I understand that you can now process Jpegs and Tiff files in Camera Raw. When I am finished making the adjustments in Camera Raw, I’ve set it up so that the image is saved as a 16 bit Tiff file at 300 DPI and opens up in Photoshop. Tiff files are great for printing your images and are layered files. If you use Adobe’s Lightroom, you’ll notice that the Camera Raw adjustments are similar. 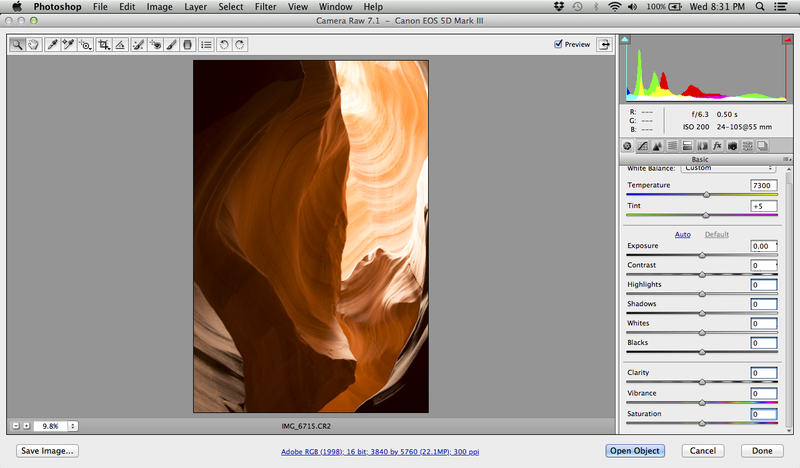 This raw image below taken at Antelope Canyon presents some common issues when shooting in slot canyons. Extreme highlights and shadows. 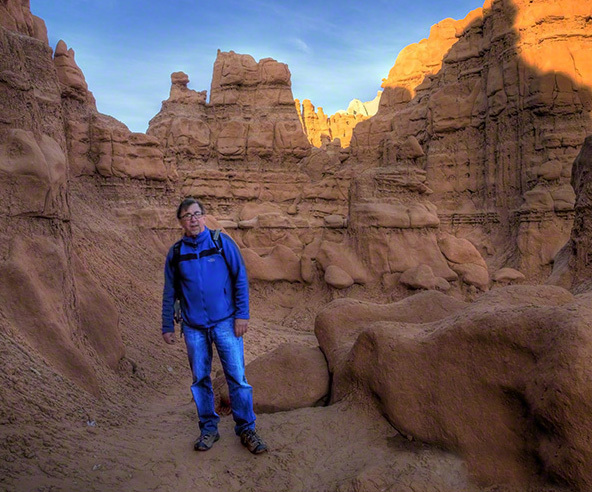 You could photograph this in 3 exposures by bracketing and process as an HDR image. But I’ve found with Photoshop 6 and Camera Raw, you can make big adjustments to highlights and shadows without image degradation. I still bracket but don’t use HDR so much. Below is the image as shot. Notice the blown out highlights and dark shadows. In this next screen, you’ll noticed I moved the highlights slider to the left and the shadow sliders to the right. You now get a more evenly exposed image. I also moved the clarity slider to get more sharpness and luminance. These moves took about 30 seconds. As you can see, the highlights have been toned down and the shadows have opened up without degradation and pixelation. The histogram at the top right shows how the highlights and shadows have evened out, especially the highlights. This move is one of many you can do in Camera Raw. Camera Raw is very easy to use, having bigger sliders than Lightroom’s and can be the “end all” for all of your photo editing. I do take these images and run them through Photoshop for other alterations and then save the tiff file as a high and low rez jpeg file. If you have any questions, please feel free to contact me! Helpful article. Thank you very much. If you are looking for a software to send pictures to someone then take a look at Binfer. A nice photo sharing tool to add to the list. Thanks for the info on photo sharing tool Paul. Looks like a great idea.